Anyone looking for raw carob pods? I have carob trees almost out my back door. The pods drop everywhere. Just wanting to know if there is a law about selling carob pods? I know my dogs love them as treats right off the trees and they make good snacks for anyone looking for something sweet to snack on. Just watch the locust bean gum seeds. They are killer on the teeth. It's actually quite a good idea. As you mentioned, carob pods are a nice and safe treat for dogs. I've also read that a number of mother's give them to their babies to chew on (like rusks) to help with teething and in place of a plastic teething ring. I thought that was pretty novel and a clever alternative. Adults also enjoy snacking on dried carob pods, so the possibilities are definitely there. I'd think a lot of people would prefer to purchase carob pods grown in California rather than order them in from overseas. We do have quite a few people who visit this site who are particularly interested in carob. We are just getting ready to launch our new CCM Store for vendors in the next couple of days, so you could list them for sale and see if you get any takers. Anyone have carob pods near Santa Rosa, CA? Waiting for some new ones to grow. Might be next year! Has anyone heard back from Dee? I didn't see that she ever responded to anyone here on the site. Were you able purchase the pods from her? And if so, were you satisfied? I have carob pods. If interested please email me. My name is Pablo, I'm from Spain. I'm in the carob business. I can provide you carob pods all year. If are you interested, please contact me. Have been looking for safe carob for months! My son has so many allergies and so cross contamination is a big issue. He asked to try carob pods for his birthday. Please send me a message if You have any that are not near corn or wheat fields or spraying. If you sell, please email me at marlonlara@rocketmail.com for quantity and price. Thank you. CAROB PODS (Live in sweden,is it possible send here??? I could only find them in EU if you have them please contact me joannasonya@aol.com I love them and they are so good for you. Carob beans in Perth ...W.A. ALOHA I would LOVE to get some raw carob pods. I tried them at the Raw Spirit Fest. in Ariz. and Loved them. I have a "Retro Raw" Boot Camp on the Big Island and having some of these for not only me but for friends and campers would be awesome! How much are the Carob pods? I would like to buy some. Depending on price between 2-10 lbs. I have been looking for raw carob pods. Please contact me at 760-580-0510 if you have carob to sell. Thank you. You have another taker on the carob pods here! If you have raw carob pods for sale that are clean and nicely harvested, please contact me at karen@consciousbeingwellness.com. Thanks! I would like them for my family and me, and also for healthy snacks for my workshop participants. I am interested also in buying raw carob seeds. 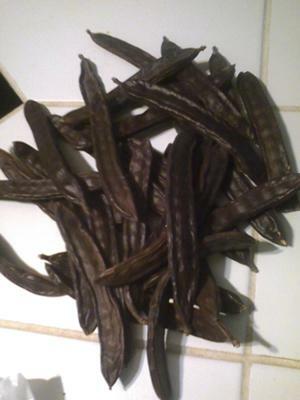 I would like to purchase carob pods, could you please contact me at Ayca.stiffel@yahoo.com for details. Thanks! I am in NJ and looking to buy Carob Pods as well. I would love to purchase some fresh carob pods. Please email me at itsnottami@yahoo.com. Thank you! I HAVE 10 large carob trees which are loaded with Carob pods in season in San Diego County, please call 858 748 8690 if you would want to buy them. I am also interested in buying some of the Carob pods. Contact me at feyanni@yahoo.com. I use paypal or we can make other payment arrangements.